Faced with the challenge of low water levels, a shared recreational area and the need for easy maintenance, Federation Council in New South Wales had its work cut out for it to come up with a solution to replace the old, unserviceable Victoria St raw water pumping station in Corowa. 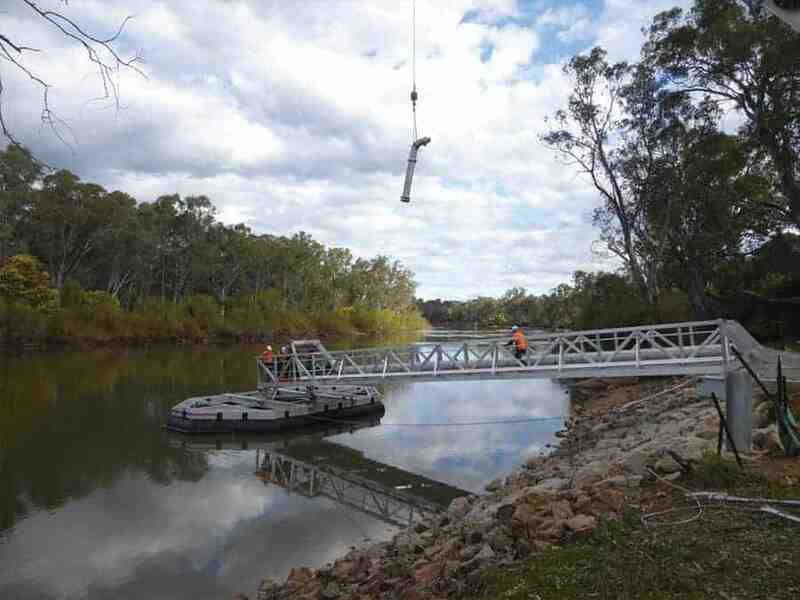 With traditional pump station designs unable to provide a solution, the Council came up with the unique design of a floating pump station, sitting on the Murray River. The town of Corowa is situated on the Murray River around 50km west of Albury, and its 6000 residents make up half the population of Federation Council. It has two raw water pumping stations delivering water to a distant water treatment plant which supplies water to the town. When the old Victoria St Pump Station was built to replace an older pump station as a compromise to building a water treatment plant, it was intended to provide good quality water to the town by pumping through a natural two-metre deep gravel filter bed in the river. However, the pump station struggled with high suction head problems when the river was low, which led to the pumps suffering cavitation damage and requiring frequent replacement. Furthermore, when the river was in flood, the pump station could only be accessed by boat. Maintenance of the pump station posed additional problems, as the gravel filter bed could not be satisfactorily cleaned with the backwash system in place and was getting worse every year. This caused a ripple effect, as maintaining the three bore pumps was difficult because suction head losses were high, and they could not perform to their design duty, especially when the river was low. The pump station was in desperate need of replacement. Yet significant research would need to be undertaken in order to design a pump station that was able to deliver the required flows; that was easily operated and maintained; that could be built with minimal construction risk so far as it affected cost and the environment; and didn’t impact recreational water skiing activities on the river. Federation Council’s Special Projects Officer, Geoff Lewis, spoke of the design dilemma, “To reach deep water for the pump suction intakes meant extending the pipework well out into the river, but this would conflict with navigation on the river and interfere with speedboating. Of all the options considered by Federation Council, Mr Lewis said the floating pump station was the only one where all of the infrastructure was above water, providing the best maintenance and construction scenario, and offering a unique solution to the long-standing problems of the old pump station. “The design allowed all of the fabrication work to be done off-site, in controlled conditions, with installation taking place quickly, with least risk. “The only site work comprised of demolition of the old pump station, placing rock for erosion protection of the river bank,and constructing the concrete anchorage,” Mr Lewis said. The contract was a design and construct contract, which was inclusive of all structure, pumps, pipework and electrics. This type of contract was necessary because of the interdependence of the structural design, and pump and pipework design. Total Eden from Shepparton was awarded the contract, with Newcastle company Hunter H2O providing engineering support throughout the tender, design evaluation and construction supervision phases of the project. The floating pump station has gantry mounted horizontal centrifugal pumps located over a pontoon, and it is connected to the riverbank with a long walkway that supports the pipework and power cables, and anchors the pontoon to the riverbank. The challenge for the new pump station will be to provide an installation that can pump water from a depth of less than 450mm. “The main challenge was to have the pumps operating in sufficient water all year round especially in low river drought conditions,” Mr Lewis said. 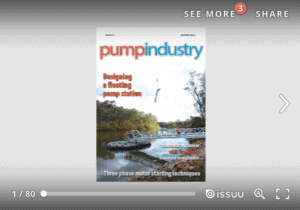 “When selecting the pumps, the most important consideration was having sufficient immersion of the pump suctions in the water so that vortexing did not occur and therefore loss of flow. Equally the suctions had to be minimal depth so as not to strike the river bottom when the river is at its lowest level. 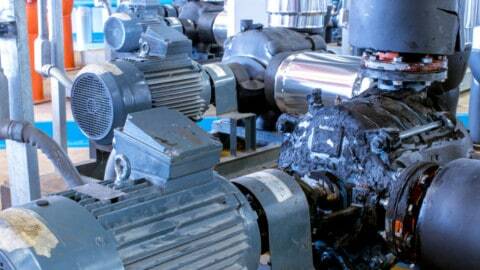 “Pump commissioning comprised operating at various flow and head duty points as the pumps have variable speed drives,and factory testing of motor performance was also undertaken. Site testing required operation at the required duty points for a minimum specified time period. As it is articulated, water can now be pumped at any river level, even in drought or flood conditions. Maintenance and repair costs were also of significant importance, as they defined the nature of the equipment, and therefore the capital cost of the project. The persistent maintenance and operating issues of the previous pump station meant underground or underwater equipment was to be avoided, with ease of operation and maintenance the highest priority in Council’s final assessment of the proposal. 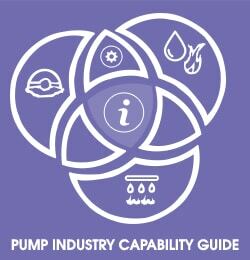 “The pump units can receive routine maintenance in situ, as they are open and easily accessible,” Mr Lewis said. The gantry and pump bases are designed so that the pumps can be disconnected from the suction and delivery pipework and winched along skid rails up the gantry to the river bank. Once there, they can be picked up with a franna crane, or similar short reach truck mounted crane, for delivery to a workshop. As the river is also a popular water skiing location, the design of the pontoon had to take this into consideration, and therefore had to be close enough to shore so as not to interfere with river navigation, but be far enough out to access deep water. This was achieved with a 22m long gantry which avoided any need for river bed excavation, but remained within the 25m navigation interference limit. “Because the pump station is located above water, it had to be as maintenance-free as possible” Mr Lewis said. The pump station also needed to be able to resist flood debris loading and have secure flotation capacity. The foundation concrete block — which is on six metre deep piers that anchor the braced gantry — combined with twin stainless steel cables anchored to an upstream pier, provide security against flood loading. Flotation redundancy is achieved with capacity being double the load and accompanied by six separate flotation modules. 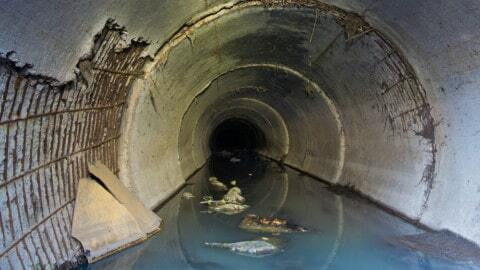 The $600,000 contract was completed in late 2018 and brought an end to the Council’s 50-year struggle to maintain a deteriorating pump station. Federation Council General Manager, Adrian Butler, said, while the design of the pump station presented many challenges, the final result was a credit to all of the staff and contractors involved.